If you missed yet another Yankees loss last night you probably didn't see Aaron Hill complete one of the most exciting/awesome plays in baseball. The straight steal of home plate. 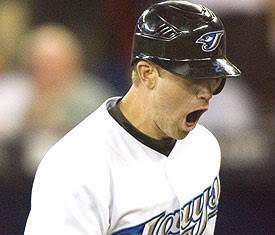 With the count 1-1, and Jays catcher Jason Phillips on first base, Hill got the go ahead from third-base coach Brian Butterfield to steal home if the opportunity was there. As Pettitte went into the stretch, he turned his head turned toward first base in anticipation of the next pitch, and Hill made a break for home plate. Yankees third baseman Alex Rodriguez and catcher Jorge Posada began screaming and wildly waving their arms, desperately trying to get Pettitte's attention. By the time Pettitte realized what was happening, though, it was too late. You can watch the video below if you'd like, but I'd suggest not to. George Steinbrenner can destroy you if he knows your IP Address....and trust me....he will bring you down. Bring you down to Chinatown my friend. I love how people in the stands just have a feeling that something is going to happen, and start rolling film (turn on their cell phones). Pretty soon we won't even need SportsCenter. Bwahaha. Stupid Yankees. Couldn't happen to nicer fans. Wow...there was a catcher on first? A CATCHER? From the way Pettitte was focusing, you'd have thought Rickey Henderson (circa 1982) was over there. Was it necessary to have 2 minutes of video leading up to the steal? Either way, can't say I've seen a much better job of stealing home. Notice how the 2nd baseman didn't seem to make much of a ballywho about the guy stealing either.